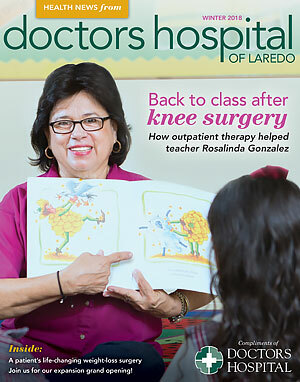 Health News from Doctors Hospital of Laredo is a publication designed to bring you the latest news as well as health and wellness information you can use throughout the year. You can read the latest issue here, or sign up to have Health News mailed directly to your home. "Everything has improved after surgery." Before having weight-loss surgery last March at Doctors Hospital of Laredo, Elizabeth Ortiz wore a size 26. Now she is a size 16, and she’s continuing to lose weight. Walking, bending down and staying active with her young students are part of Rosalinda Gonzalez’s everyday life as a teacher and director of Los Pepitos Schoolhouse in Laredo. It’s important to recognize that winter is a time of increased viral as well as bacterial respiratory infections, says allergist and immunologist Jane Unzeitig, MD.